Great for beaches, parks, and sporting events, the Lightspeed Outdoors Quick Beach Canopy Tent is the perfect place to get out of the sun. It features a built-in sidewall that protects from the sun and wind. The beach canopy provides UPF 50+ shade for all-day outdoor fun on the sidelines with your team, on the sand, at the park or in the backyard. The Lightspeed Outdoors' integrated poles and bottom-pull hub system, allows for instant set up and tear down. Lightweight and easy to carry, the beach canopy tent offers an asymmetrical pole configuration that handles wind gusts with ease. This beach canopy measures 95 x 59 x 59-inches (LxWxH), packs down to 50 x 5-inches (LxW), and weighs 7-pounds. Construction materials include 190T breathable polyester for the canopy tent walls and 110g PE for the floor. Lightspeed Outdoors is committed to making the outdoors easy so you can spend less time hassling with your gear and more time enjoying life -- no matter if your passion takes you to the beach or the mountains, warm weather or cold. At Wildhorn we want people to make the most of their time outdoors so you can spend more time making memories with the people you love and care about and less time fussing with the gear you use. We live by our motto to "Share The Wild", and invite you to do the same. - Our QuickUp automatic frame system allows you to set it up in seconds. - When you are at the beach you can easily set up the shelter in canopy mode that provides extra room and extra shade for the entire family. - The Sun Escape XL is one of the largest beach shelters on the market. Most shelters can only accommodate 2 adults but with 56 sq ft. it is as big as a standard 4 person tent. - Raining? No Problem! 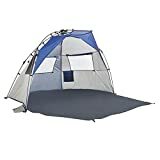 Convert the shelter to tent mode to stay dry. The shelter has 5000mm waterproofing that will keep you dry in light to medium rain showers. - The Sun Escape has a 50+ UPF rating which means you can actually escape from the sun. 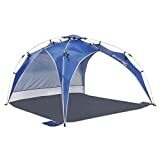 - Included in the package: Sun Escape tent, 8 stakes, 2 cabana mesh sides, 2 canopy poles and 2 sand screws. - Not only a beach tent, the Sun Escape is built for camping trips as well. MULTI-FUNCTIONAL - This will be the most versatile shelter you will ever own. 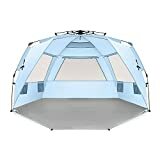 Use this as a beach tent, canopy, cabana or as a camping tent. This is the most unique beach shelter/tent on the market. SHARE THE WILD - With 56 sq feet of floor space and 4' 8" tall, you will have all the room you need. Share the wild with your entire family. QUICK-UP AND QUICK-DOWN - Our QuickUp automatic frame system sets up in seconds so you can relax and take in the ocean breeze, outdoor festival or sporting event. You don't need to worry about taking the kids out in the sun anymore. DURABLE & WATERPROOF - Where do we start? 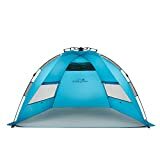 With waterproof 210T Polyester Ripstop, thick 300D Oxford flooring, durable zippers and sturdy 9.5mm fiberglass frame you can enjoy this cabana tent for a long time. PORTABLE - Don't let a bulky shelter slow you down. Our shelter compacts down into an oxford carry bag that is actually functional and not just an afterthought. It includes easy to use cinch straps that help stow away the tent quickly. 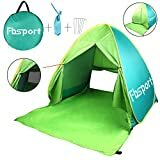 High quality, lightweight, and portable beach tent upgraded independent personal space! You can change clothes at any time inside, do not need to go to a lock room.It could be very good protection for personal privacy activities. MonoBeachbeach tent is made of 190T silver coated polyester Oxford fabric ( same waterproof quality with umbrella). MonoBeach provides 18-month warranty and friendly customer service to all customers. Contact us in time through our "Customer Service Card." *Do not use this tent nearby fire, it's very dangerous. * Please wipe with the soft cloth when it is dirty. * It's really easy to fold it up. Please be more patient. 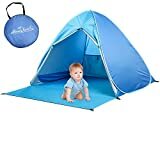 [Upgraded]: MonoBeach upgraded pop up beach tent: more convenient and comfortable.We increase curtain in front of the tent that make you and kids have an independent personal space on the outside. [Recommend]:2-3 PERSON;1 ADULTS OR 1 ADULT, 2 CHILDREN. [UV Protection]: Special silver coated fabric around the full coverage to ensure that the coverage area of Anti-UV effects. Make sure that you keep away children from damaging of the strong sunshine. [Specifications]: Weight: 2.2 pounds; Size: 65 x 59 x 43.5 inches (L x W x H). [Used widely]: Sun protection for all-day shade at the park, beach, sporting event or just relaxing in the backyard, comes with its own carry case. Love being outside and enjoying the sun but really hate being fried? 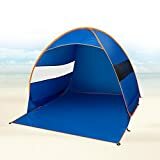 Take FiveJoy Instant Pop-Up Beach Tent with you! Take FiveJoy Instant Pop-up Beach Tent with you and enjoy the beach! Click "Add to Cart" yellow button above and get it now!  COZY PRIVACY in the SHADE- Nothing beats the cool ocean air, and warm sand between your toes. Lay back and relax with your friends and family in the comfortable shade of your cabana beach tent. Do you hear the waves calling?  STRONG UV and SUN PROTECTION - Sunburns are painful and extremely harmful to your skin. Tough UV30 coating on the tent provides extra protection so you can kiss sunburned skin goodbye. Keep your water, beer, beach bag, electronics and other things in the shade so you can quench your thirst with a refreshingly cold drink. Perfect for keeping kids and babies cool and comfortable. ⚓ SAND POCKETS AND TENT STAKES FOR ANCHORING - No one wants to be that guy stumbling after their beach umbrella in the sand. Use the included tent stakes to secure your tent to the ground. Fill the attached sand pockets with sand or rocks to weigh down the tent if you are unable to use the stakes. ☀️ BUILT FOR YOU - We've kept all your comforts in mind when designing this canopy tent! Mesh windows on the left and right sides provide great cross VENTILATION so you can enjoy the sea breeze while keeping out of the hot sun. Pack a picnic and store your food within the Sun Shelter to protect it from sand. Take this COMPACT, PORTABLE beach tent with you on your next beach or park getaway!